Info "Wait for the right moment to head it into the goal!" Use Your Head is one of Dribble and Spitz's Microgames in WarioWare: Smooth Moves. "Use your head" is a phrase that means "to think". 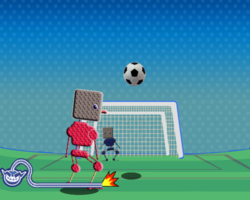 The objective is to header the soccer ball into the goal by jumping at the right time. 1st level difficulty: Straight path. 2nd level difficulty: A spiked ball will pass in the way. 3rd level difficulty: The ball will be deflected by a defender, so it will come faster. This page was last edited on February 20, 2018, at 15:39.